Coconut oil is one of the best oils on planet earth you can eat, bake and cook with. There is a lot of information on the Internet about it's benefits but this article from Organic Facts sums it up best for those of you new to it. We began incorporating coconut oil in our personal diets after using it in our baked goods and have experienced amazing results! Weight loss, clear complexion and low cholesterol to name just a few! Lately I've been saving these fabulous jelly jars from our favorite store bought jelly (for two years in a row now I sold all our extra homemade jam and by fall we are completely out!). I've re purposed them for many things and lately they have become our "lotion" jars. We use coconut oil for chapped lips, night cream, body cream and most recently on my surgery incision scars (because of it's antibacterial and soothing elements). 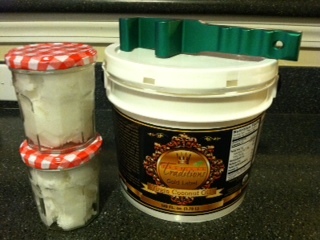 We purchase our oil in gallon containers (did you see the green Pail Opener? It's a must so invest in one when you order by the gallon. It's worth the money as these lids are extremely tight fitting!). I made two jars, one for each bathroom upstairs. Whether or not you order from TT please do your own research on the health benefits of this amazing whole food and test it out on your dry, chapped winter skin. You will see the difference over night!